The cab side sheets were temporarily placed in position on Monday 24th August. Alignment with the bunker was carefully checked in order that the angle sections which act as support feet low down inside the cab sheets could be correctly positioned. The curved right angle sections which join the roof to the front cab sheet and rear bunker sheet have been drilled. There will be further occasions when the cab briefly appears on the loco and then disappears again whilst various checks and adjustments are carried out. The smokebox door hinges and locking arrangements are now to hand and the smokebox wrapper has been marked out for various additional holes to be drilled for items such as hand rail pillars, vacuum ejector exhaust, chimney and so on. Prices are awaited for casting the chimney and ejector exhaust ring, also the expansion link brackets for the motion brackets. Machining continues on the keeps for the pony wheel axleboxes, brake shaft bearing brackets and forged spring hangers for the driving wheel spring arrangement. The axleboxes for the driving wheels are being whitemetalled and at Buckfastleigh work proceeds towards balancing the driving wheels. As usual we will have sales stands at Bridgnorth and at Kidderminster and our annual tombola will as usual be held at Bridgnorth for the Gala. It's rather late notice but if anyone can donate a suitable prize it will be gratefully received. The engineering team will be working on Mondays and Wednesdays and will be happy to accept gifts. Bottles, chocolates, biscuits, perfume and after shave are really popular and encourage people to have a go! Thank you in advance. 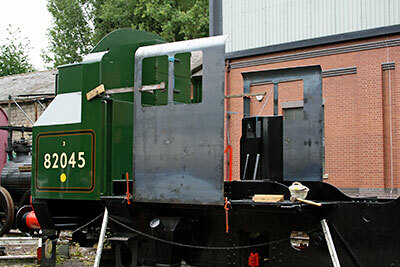 The boiler appeal continues to bring in consistent support, and we now have the funds in hand to make very considerable inroads into the construction of both boiler and firebox. I hope to be able to report, in next month's updates, that work is under way. 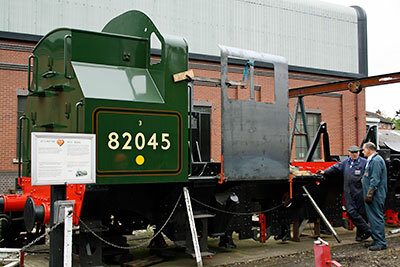 While we are still focused on the boiler, financing the motion and valve gear are also receiving attention, as this collection of items is going to cost in excess of £100,000. We may therefore launch a final appeal for funds in the early part of next year. Watch this space: while our income streams could look after a good proportion of this part of the build, we need to be able to commission the forging of motion components sooner rather than later. This is not a case of financial overkill - as well as working to raise funds to complete the engine, I also need to keep an eye on ensuring that finance will always be available to pay for running repairs and overhauls. The project will not come to a halt when 82045 takes its first train out of Bridgnorth. That would be folly in the extreme, and I am a firm believer in always being as independent as possible! 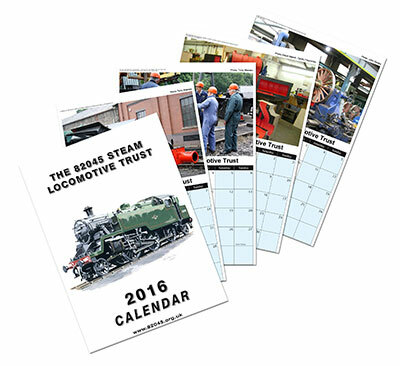 Please get in touch with Chris if you would like to sponsor, fully or partly, one of the coupling rods, estimated cost approx. £20,000 for the four rods. Once we have bought these, we will have the forgings for the biggest components of the engine's motion as we already have the connecting rods (see July News). The other items of the motion and valve gear are smaller, and, while none of them will come cheap, they are also ideal subjects for sponsorship and will be offered in due course. Brian Malyon and Rod Derry discuss the finer points of cab construction. The cab sides temporarily in position.